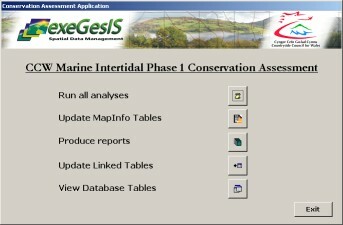 exeGesIS analysed Marine Intertidal Phase 1 data for the whole of Wales using the standard CCW Conservation Assessment Protocol. Rather than do this manually, we agreed with CCW that we would develop a database application in Microsoft Access. This application reads the original survey data in MapInfo format, undertakes all the necessary analysis and outputs new MapInfo tables and reports containing the results, measured against SSSI selection criteria. This is all achieved through a simple interface. This reduces weeks of manual analysis to less than 20 minutes of computer processing time. The sites were then interpreted manually to identify a suite of sites that should be considered for further nature conservation. View the Marine intertidal habitat review and assessment report.